Anybody who has been on an African safari will probably come across quite quickly in their game drives the humble Impala antelope (Aepyceros melampus). These medium sized antelope have two recognised sub-species that being the common Impala (Aepyceros. melampus) and the black-faced Impala (Aepyceros melampus petersi) of Angola and Namibia. The Impala is an animal of the great African savannah and woodland edges from where it can seek cover and as this is the Impala's natural habitat it has become a great 'prey' favourite of the big African cats like the Lion, Leopard and Cheetah, with this in mind those on safari often see these antelope at large cat 'kill' sightings. 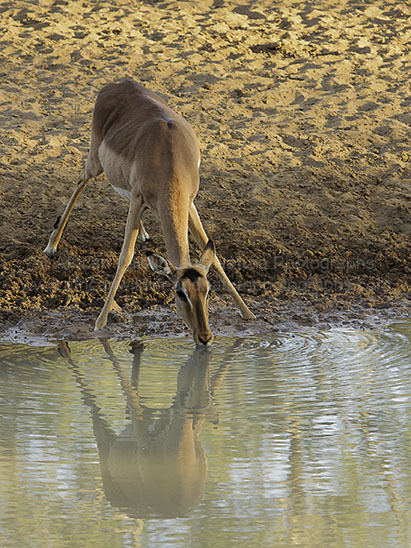 Impala (Aepyceros melampus) female drinking from a waterhole, a daily occurrence.